The new Ford Focus Hatchback is one of the best all-rounders on the planet. The evergreen family car is great to drive, great for young families, and affordable to run. It’s also safe, fairly practical and comes with a reputation you can trust. There’s no three-door version anymore, however, while the fact that it looks so dull could harm its appeal. But if driver engagement tops your list of priorities, there are no better rivals in this sector. Ford has a long history, read more about their last century in our brief history of Ford. OSV takes a closer look at what it’s all about with our 2018 Ford Focus Hatchback review. Although it’s still the sharpest, best car to drive in its sector, Ford have actually watered down its steering feel this time around. It still engages you, and it still takes corners brilliantly, but it’s just not as sharp as it used to be. Possible reasons for this? We can only assume that Ford wanted to broaden its appeal. There’s a bit more body roll in bends than last time and less grip on offer. The steering isn’t as accurate or as fast to respond, and the car is softer than its predecessor. However, we’re probably nitpicking. Sure, it’s not as driver-focused as before, but the softer suspension setup means it’s more comfortable, and it’s a compromise most buyers will be able to live with quite easily. In terms of its engines, the only one we’d recommend you overlook is the 1.6-litre 138bhp petrol unit. It’s just too sluggish. Other than that, we like the responsive and powerful 1.0-litre 123bhp EcoBoost turbo petrol engine. It can get you from rest to 62mph in 11.2 seconds, has a max speed of 120mph, and has plenty of mid-range shove. It can get a bit noisy, though. If you want more power and less noise, a 1.5-litre EcoBoost that develops 179bhp fits the bill. It has a 0-62 time of 8.8 seconds and can be specified with the sportier ST Line model. There’s also a smaller 150bhp variant of the same engine available, which is only ever so slightly slower. Rounding off the range is a performance-focused RS model that’s powered by a four-pot turbocharged 2.3-litre petrol unit that’s also found in the Ford Mustang. It develops 350bhp, and can whizz you from a standstill to 62mph in an astonishing 4.7 seconds. If you opt for one of the 1.5-litre EcoBoost engines, you can pair your Focus up with a 6-speed manual or optional automatic ‘box. In terms of out and out cabin quality, this is the best Focus yet. Its dashboard sports a more minimalist design and looks classier – even if it still lags behind Volkswagen for pure sophistication. Material quality is better, and Ford have used more soft-touch plastics than last time. The climate control switches are bigger and easier to read, while all models come with a central colour display as standard. It’s not the clearest or the biggest but it’s fairly user-friendly. The new stereo is a huge improvement over its hard-to-use predecessor, with Ford implementing logical shortcut buttons that will prove handy. Six speakers come as standard and overall it’s hard to find too much to fault with this cabin. Is the Ford Focus Hatchback practical? It’s not the most practical car in this sector, and its 316-litre boot is a bit of an elephant in the room. Many rivals offer much larger boots, and it’s only a smidgen bigger than the Fiesta. Worse still, if you splash out on the RS model, you’ll be left with a 260-litre boot. Other than that, rear and legroom could be better, although it isn’t terrible. The higher roofline ensures that headroom is at least good, and storage solutions are decent. In terms of overall, size, it’s par for the course in this sector. All models come with five doors, but the car’s new coupe stance means practicality has been reduced. Is the Ford Focus reliable? Find out more about Ford reliability by reading our honest assessment of the manufacturer. The entry-level Style model is very basic; it comes with air conditioning and Bluetooth but not a lot else. It isn’t even until the Zetec trim that you get alloys. 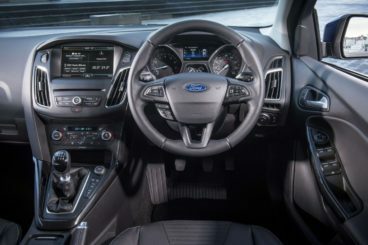 The Zetec trim also gets a better interior trim, heated door mirrors and the brand’s SYNC3 infotainment system. The Titanium model catches the eye with velour seats, adaptive cruise control, parking sensors and dual-zone climate control, while Titanium and ST Line models add leather upholstery, heated electric seats, xenon headlamps, a body kit and bigger alloys. In terms of how safe the car is, Euro NCAP awarded it all five stars for its crash test performance. Standard safety kit on all models includes a driver tiredness monitor, lane departure warning and airbags, but for advanced safety tech, you’ll need to spend more on the Titanium model. Prices for the new car start out from £17,705. For more information on our leasing deals, you can check out our page here. In terms of its running costs, a real highlight is the 1.0-litre EcoBoost engine. Whether you go for the 98 or 123bhp variant, you’ll see returns of 58.9mpg on a good day. Emissions, meanwhile, are pegged at a respectable 110g/km of CO2. The turbocharged 1.5-litre petrol returns 50.4mpg regardless of the power output and emits 128g/km. Insurance is very reasonable too, with most models occupying groups 11 to 17 out of 50. The petrols – especially the 1.0-litre turbo EcoBoost – offer plenty of performance. Ford might have watered down its driving dynamics, but it’s still the most entertaining car of its type. Avoid the entry-level model and any Focus you go for will be generously kitted out. The 316-litre boot really is the (baby) elephant in the room. Ford claim the EcoBoost engine can return almost 60mpg, but real-world economy could be rather different. 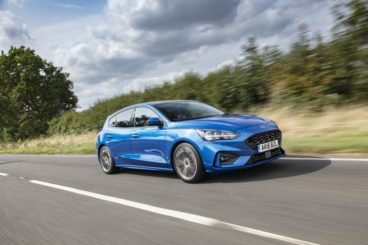 Let’s see how the car fares against its rivals in the comparison section of our 2018 Ford Focus Hatchback review. The new Vauxhall Astra is the best version yet. It’s efficient, pleasant to drive, and it looks fantastic. The new model weighs a lot less than its predecessor, and this means it can go faster than last time. It also handles better and offers plenty of grip. Ride quality is good too, and the Astra can match the Volkswagen Golf – but ultimately not the Focus – for out and out driving enjoyment. Its controls are really user-friendly, and we like how precise and light the steering is. In terms of its engines, there are five petrols to choose from. A 1.4-litre 98bhp is the one you should probably avoid. It’s small, basic, old and inefficient. After that comes a turbo 1.0-litre 104bhp engine that completes the 0-62 dash in 10.5 seconds. We like it; it’s performative, quiet and economical. However, if you want more performance from your Astra, you’ll need to take a look at the bigger engines. These include a 1.6-litre 197bhp unit that tops the range with its 0-62 time of 7.3 seconds. If your budget doesn’t stretch that far, a turbo 1.4-litre 148bhp engine is perfectly acceptable. Running costs? The 1.0-litre turbo is the most frugal among the petrols, and can return 64.2mpg at best while emitting 102g/km of CO2. The 1.4-litre 148bhp variant, meanwhile, benefits from a turbocharger and can return 51.4mpg. Emissions of 128g/km might seem high though. 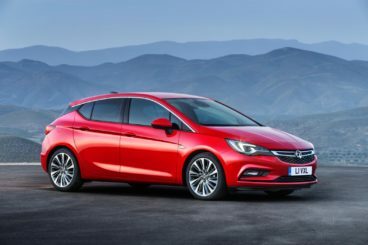 Inside, the stylish cabin matches the car’s stylish exterior, and the Astra is very much a car you and your passengers will enjoy travelling in. There are lots of soft-touch plastics here and there, access is easy and comfort levels are high. A big touchscreen dominates the dashboard; it’s easy to use and lets you mirror your smartphone’s screen with zero hassle. The infotainment system itself comes with just 6 buttons – and that’s a good thing. Is the Vauxhall Astra practical? The 370-litre boot is significantly bigger than the Focus, and it comes with a useful ribbed floor that prevents items from rolling around. The rear seats can offer 35mm more knee room than last time, and despite the car’s coupe-stance, headroom is good for all. The wide-opening doors are handy, and storage space is decent if not amazing. There are some top-notch cars in this class, and the firm family favourite Volkswagen Golf is another one. You can’t look for your next family hatchback and not take a check on the Golf. It’s thoroughly pleasing to drive, quiet and comfy. Its steering is accurate, there’s lots of grip on offer, and body roll is kept to a minimum. Out on the open road, it isn’t as entertaining as the Ford, but if you want a relaxing and smooth family car, you can’t go far wrong with the Golf. In terms of its engines, a 1.5-litre petrol was brand new for 2017. It develops 128bhp or 148bhp, with the latter providing an excellent blend of economy and performance, thanks in part to a cylinder-deactivation system. The 128bhp variant is a BlueMotion engine which also saves on fuel. It’s performative too, and can complete the 0-62 sprint in 8.8 seconds regardless of whether you opt for a manual or automatic ‘box. Alternatively, you could take a look at the smaller 1.0-litre petrol engine. It’s available with either 84bhp or 108bhp, with the former clocking 0-62 at 11.9 seconds and the latter at 9.9 seconds. Running costs? The 1.0-litre 84bhp is the cheapest petrol engine to run. It can return 58.9mpg on a good day. However, if you want more power, the 1.5-litre 128bhp petrol engine is good for the same returns, thanks to its energy saving technology. Inside, the Golf boasts arguably the best cabin in this class. Quality is high, everything feels classy, and the driver’s seat provides you with the right amount of comfort and support. In fact, the driving position itself is nothing short of superb. The wraparound dashboard has the look and feel of a much more expensive car, and the Focus can’t compete with the materials on offer in here. The likes of metal-effect highlights are seriously impressive stuff. 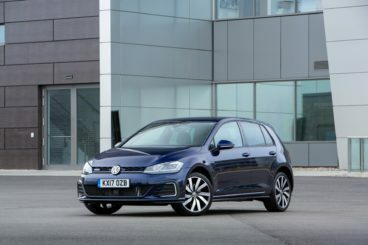 Is the Volkswagen Golf practical? It’s available with either three or five doors, though the latter edges it in terms of practicality. There’s more rear legroom than last time and plenty of clever touches. These include some neat storage spaces, such as a cooled glovebox, and a 12v plug inside the boot. Speaking of the boot, it measures 380-litres, which makes it considerably bigger than the Focus. Fold the rear seats and you can increase it to 1,270. As far as all-rounders go, it’s hard for any car to match the Focus. It faces some very strong competition and your decision won’t be an easy one, but making a case for the new Focus is simple. It remains the most fun car to drive in this class, it’s affordable to buy and run, and it’s safe, reliable and a name you can trust. Moreover, there’s literally a version to suit everyone – including the hot hatch RS model. As always, the new Ford Focus Hatchback is number one.